This article was originally published at 8:56 p.m. EDT April 14, 2016. A coalition of Democratic lawmakers and veterans organizations is vowing to block any legislation that includes proposed cuts to the Post-9/11 GI Bill, even if that means shelving a host of other proposals they authored. At issue is a measure passed without objection in the House earlier this year which would cut in half the housing stipend for dependents of veterans attending school on GI Bill benefits. The move would save the government about $773 million over the next 10 years and help pay for a host of other veterans initiatives. 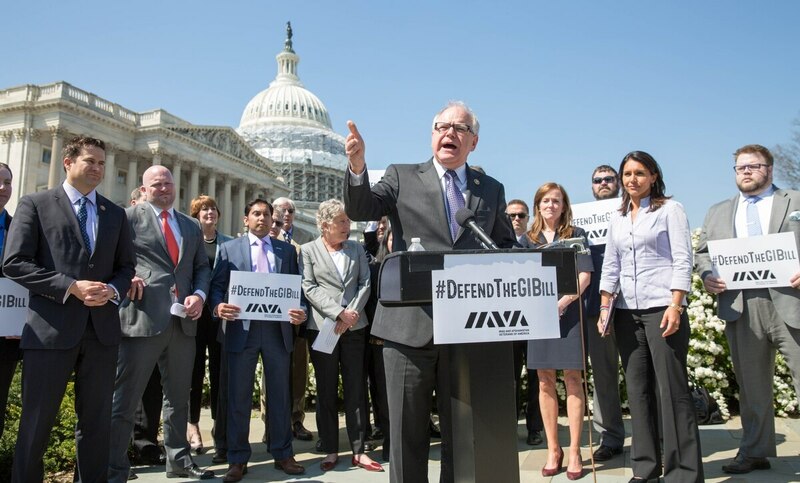 "This goes back on a promise that all of us here are unwilling to break," said Rep. Tim Walz, D-Minn. "In the entire federal budget, there is nowhere else to fund [veterans] programs? That cannot stand." For students in high-cost cities such as San Diego or New York, that cut would total $1,000 to $1,800 a month. It would not affect students already using the transferred benefit but could affect families planning on the extra money in the future. But officials from Iraq and Afghanistan Veterans of America said the move goes back on a promise made to those families that the full benefit would be available when they need it, and for the first time pulls money out of the GI Bill to fund outside programs. They painted the legislative proposal as a betrayal of veterans' service and accused lawmakers of viewing earned benefits as a "piggy bank" for other wants. "This is a whole new level of stupid, to cut the GI Bill in a time of war," said Paul Rieckhoff, CEO of IAVA. "This is about keeping a promise, investing in the future, about retention and recruiting and morale. "Find the money somewhere else. Either you're with us or against us." Officials from Student Veterans of America pushed back on that ultimatum, saying the issue is more complex than the opposition coalition will admit. "We need to remember who the Post-9/11 GI Bill was intended for: veterans," said Derek Fronabarger, SVA's director of policy. He challenged the idea that the legislative proposal amounts to "cuts" in veterans benefits, saying "in reality the changes are a transfer of benefits from dependents, via a 50 percent drop in [housing stipends], to Fry Scholarship recipients and reservists." Supporters of the cut have also argued that the benefit is overly generous to children of troops, sometimes awarding them housing stipends well beyond their dorm and living costs. Savings from the change also would go to pay for a host of other programs, leaving other veterans groups with a difficult choice of whether to support the proposal. "The Veterans of Foreign Wars would never actively support any standalone provision that reduces benefits for veterans or service members, but we felt that [this bill], taken in its entirety, contained enough good provisions to support its passage," said VFW national spokesman Joe Davis. He noted that among those are improvements to postnatal care for female veterans, expanded service animal therapy for veterans with post-traumatic stress disorder, reauthorization of the veterans work-study programs, and critical changes to VA home loan guarantees. But Walz and others argued that's a false choice. Michael Little, director of legislative affairs for the Association of the United States Navy, said any cut to the GI Bill benefit risks adding to the stress load of military and veteran families. "If we want to talk about funding veterans' benefits, the last place we need to look for money is in the GI Bill," he said. "The discussion about the GI Bill shouldn't be about where we'll cut, it should be on sustaining and strengthening it beyond our current military budget situation." So far, Senate lawmakers haven't indicated whether they'll move ahead with the House proposal or revise it for inclusion in an anticipated veterans omnibus package due out before the end of the month. Opponents hope the latest objections convince them to look elsewhere for money. "When we look troops in the eye and make them promises … they expect us to keep those promises," said Rep. Tammy Duckworth, D-Ill. "It's not fair to rob one group of veterans to pay for services for another. Leo Shane III covers Congress, Veterans Affairs and the White House for Military Times. He can be reached at lshane@militarytimes.com.